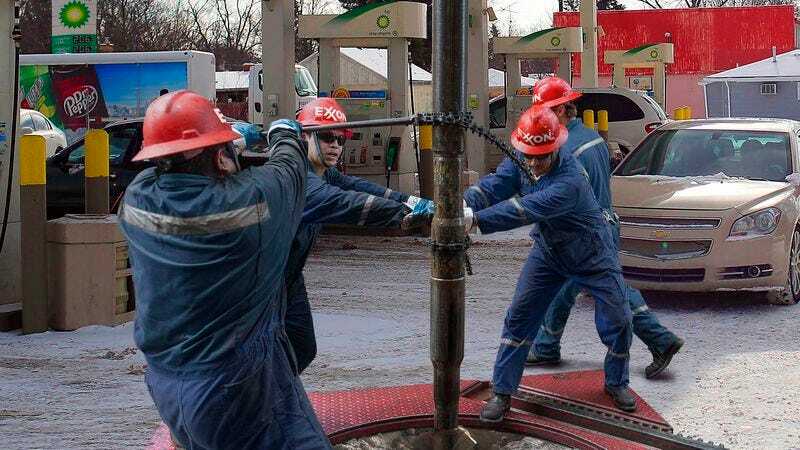 IRVING, TX—Hailing it as a rapidly replenishable and easily accessible fuel source, ExxonMobil revealed a lucrative new oil extraction method Friday that involves drilling directly into gas stations. “We’ve found nearly unlimited reserves of highly refined petroleum mere meters beneath thousands of service stations across the country,” said ExxonMobil CEO Rex Tillerson, noting that the company had already erected oil extraction rigs alongside pump islands in all 50 states. “As I speak, we’re yielding 3 million barrels per day just by boring through a few thin layers of asphalt, concrete, and metal. And, amazingly enough, the supply seems to somehow refill itself every week.” Tillerson went on to say that the company was exploring the possibility that there were still massive untapped sources of oil already in Americans’ cars, as well as in their homes.